I think this was the last English-translated Henry de Montherlant work left for me to read, which is depressing. Speaking of depressing things: Port-Royal. This is one of de Montherlant's Catholic-oriented historical dramas, telling the story of the Jansenist nuns of the Port-Royal convent who were persecuted by the Pope for their Calvinist views on free will. It did not disappoint as a finale. Bleak and beautiful at the same time. 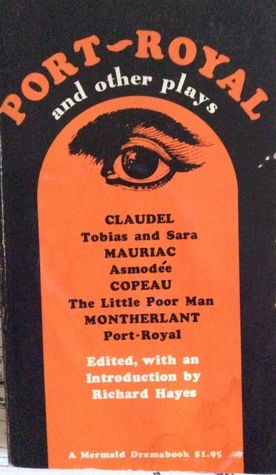 Five stars.The other plays in this volume--Asmodée, by F. Mauriac: A sort-of love story, kind of. It reminded me of "War and Peace" at times, just in the style. I liked it!Tobias and Sara by P. Claudel: Weird and mystical retelling of the Book of Tobit, which does not appear in your standard protestant Bible. Fish wrestling! I didn't care for it.The little poor man by J. Copeau: A dramatized life of St. Francis of Assisi. Intense! You'd like it if you were super-religious, I bet. A for me, meh.Still, this volume is worth it just for Port-Royal.